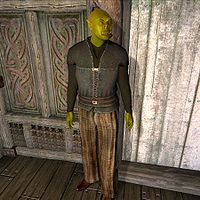 Graman gro-Marad is an Orc enforcer who lives in the Imperial City Temple District with his wife, Umog gra-Marad. He works for Ormil as the bouncer at The Bloated Float Inn in the Waterfront District, though he says the Imperial Watch ends any fights that erupt before he can stop them. His employment at the Bloated Float takes the majority of his time and his life is rather monotonous; starting at 6am, Graman eats a two-hour breakfast with his wife, then wanders around the ground floor until it is time to go to work at 2pm. Once at the Bloated Float, he positions himself next to the front door and watches over the many customers for the rest of the afternoon and all evening. At 5pm he takes a short break and sits down and enjoys a one-hour dinner. At midnight he heads back to his home and wanders around all night long, due to a bug. He wears a combination of low and middle class clothes, the low class coarse linens, middle class doeskin shoes and the rare and weightless middle class dark shirt. He also carries a medium amount of gold and his key. When you talk to him, he will say: "Move outta' my way." regardless of his location. If you ask him about the big city, he will explain his job at the inn: "We rarely get real trouble here. The Watch puts a stop to rough stuff damn quick. I'm mostly ornamental at the Bloated Float. Makes folks happy." Wherever he is when you trigger An Unexpected Voyage Graman will be the one banging on Storage Room Door, most often audible after you have disposed of the first Blackwater Brigand, Lynch who carries the key to his involuntary prison. When you pry the door open, Graman will be grateful: "About time someone showed up." When you talk to him he will give you an overview: "Thank you for freeing me. I'm Graman gro-Marad, the Bloated Float's bouncer and helmsman. I've been locked in that storage room for hours. I don't know exactly what's going on, but not long ago, a gang of thieves calling themselves The Blackwater Brigands stormed the ship. They took myself and Ormil, the Float's owner, hostage and put the ship to sea. I have no idea what they're after. If you can get me safely to the top deck, I can steer the Float home. But I'm not budging until the coast is clear. I'm used to dealing with drunken louts, not a gang of well-armed thieves." He will then elaborate on the mysterious Blackwater Brigands: "All I know is there seems to be four of them. They blindfolded me before they put me in here, so I didn't see much." On the Bloated Float, he will inform you: "The Float has three decks. This deck is the inn deck, the next level up is the tavern deck and then there's the top deck." He will send you on your way with: "Good luck... you'll need it." If you talk to him again he will repeat: "I'll wait here until the tavern deck is clear." "I'm not moving the Float until Ormil is safe." The scared bouncer will then add: "I'm staying right here... where it's safe." meaning inside his Storage Room until the you have fought and killed Minx in the taproom; he will then come up the stairs and only comment: "Nice work." He will then reveal his next ‘step’, obviously a plan to let you do all the fighting for him: "I'll wait on the tavern deck until you clear the top deck. That's where the ship's wheel is located." On Selene he will offer sparse information: "I thought I heard an Imperial woman's voice while I was blindfolded. Other than that, I don't know much more about her." Once again, he will send you on your way with: "I await your return... if you return." When approached again he will clarify: "I'm not going to the top deck until it's safe." He will also ask: "Top deck clear yet?" 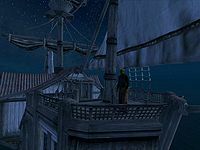 Only after you have disposed of Wrath will the scared bouncer start to move: "Sounds like the coast is clear, so I'll make my way up to the ship's wheel. But I'm not moving this hulk an inch until Ormil is safe." He will then provide a warning: "Be cautious... their leader sounds dangerous." From his safe spot near the wheel he may say: "This ship doesn't move 'til I know that Ormil's safe." Talking to him will just make him repeat: "Like I said, I'm not moving the Float until Ormil is safe." After your encounter with gang leader Selene, Graman will finally do something useful: "Many thanks. I'm preparing the ship for her return." If you have yet to speak to Ormil, Graman will point you towards his boss: "Thanks again for helping us. I'm sure Ormil will reward you appropriately." If you have already spoken to Ormil, Graman will instead say: "I'm sure Ormil can help you now. I'm busy trying to get us home." With the Bloated Float docked safely and the quest completed, he will show his gratitude: "You're welcome on board the Bloated Float any time." He will also reflect a bit on Selene; if she was arrested, he will laugh: "I saw them haul her off to jail. She was not happy! Ha ha ha..." If she died, he will instead say: "Too bad she's dead. She wasn't a bad looking woman... for an Imperial that is." Two additional greeting were recorded for Graman, but his tough-guy "Move outta' my way"-line always takes precedence. This means the greetings "Graman gro-Marad. I'm a bouncer for the Bloated Float. My wife, Umog, is a night guard for Master Umbacano." and "Graman gro-Marad. I'm the night man on the Bloated Float." can never be heard. Additionally, he was supposed to describe the Imperial City differently if approached during his free time: "The Bloated Float rents beds. Only place on the waterfront. Cheap. And it's safe." Lastly, his final comments about the Bloated Float and Blackwater Brigands will always be deleted because he forces conversations to finish after he enters the top deck: "She's ready to sail, don't worry about it. We'll get you back home in one piece." and "Nice work getting rid of them. If you ever need a job as a bouncer, I am sure I could put in a good word at some of the tougher taverns in town." After the quest, Graman stays aboard the Bloated Float 24 hours a day. He was supposed to sleep in his house between midnight and 6am, but will never enter the private quarters.